Bingers, I am pretty sure most of us grew up watching the Harry Potter movies and even read all the books. JK Rowling has been our hero at some point in our lives. The 7 novels have been adapted greatly into 8 films. Yet, we still craved for more. We still wanted to know more about the universe Rowling has created. We got Pottermore and in 2016, we got Fantastic Beasts and Where to Find Them. The movie was loosely a prequel to the events of Harry Potter. In fact, it goes way way back. And to be quite honest, I did not like it then. It felt like an opportunity for the franchise to get something out of nostalgia. Surprisingly, its sequel Fantastic Beasts: Crimes of Grindelwald took me by surprise with how much improvement it has been than the first! Curious? Continue reading to know our thoughts about it! Prior to Warner Bros Philippines’ advance screening of the film at the IMAX Theatre in SM Megamall, I decided to rewatch the first movie. I was not a fan then because I felt that it was unnecessary but then I was wrong. The film was rather great and a strong setup for the five-film Wizarding World franchise. My verdict came mostly from me comparing it to the story of Harry Potter. The former was lighter and more contained while the Fantastic Beasts story is more mature, political, and plays on a wider scale. The defining identity of the franchise became more pronounced in Crimes of Grindelwald. Prior to Voldemort, a dark wizard reigned first in the form of Gellert Grindelwald (Johnny Depp). He has one terrifying goal in mind- wizard fascism. He wants wizards to rule the world while the lesser beings, no-majs, or mortals will be on the outskirts. Does that remind you of one historical figure? Yep, he is the Hitler of the Wizarding World. JK Rowling’s work has always been a reflection of the real world and in this installment, she chose to reflect the fascism and play it in this particular context. Of course, to oppose Grindelwald’s mischievous plans, the MACUSA and the Ministry of Magic worked together to stop him. Albus Dumbledore (Jude Law) is also doing his part in covert with the help of Newt Scamander (Eddie Redmayne). Newt, on the other hand, is also pre-occupied with some little tasks and one of which is to look for Tina (Katherine Waterston). Fantastic Beasts: Crimes of Grindelwald asserts its trait that will set it apart from the Harry Potter stories. Its several subplots move around on a wider scale involving several characters. Or so it tried. One subplot that it focused on is the identity of Credence Barebone (Ezra Miller). 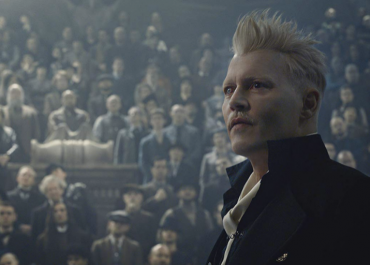 A feared squib in the first movie is now a full-on Obscurial in which Grindelwald saw an opportunity to take advantage of. To do this, he had to lure the kid with the information of his true identity. Apparently, he is not the only one riddled with family drama. Leta Lestrange (Zoe Kravitz) also has her ghosts. Yes, I know what you are thinking. And no, it is not yet confirmed whether Bellatrix is her descendant. Which brings us back to the family and identity drama. Fantastic Beasts: Crimes of Grindelwald had a rich material to work with and while it borderline relied merely on the narrowness of the lineages that will tie them back to the storyline of Harry Potter, Director David Yates brought back the formula that made the Potter movies a success. Despite its grim political undertones, Fantastic Beasts: Crimes of Grindelwald glimmers hope for the future of the five-part narrative. It keeps on surprising fans with twists and turns that even those who have an immense knowledge of the books will be stunned! JK Rowling and David Yates did deliver not only on the story but on the spectacle as well. It is relevant, dark, and a worthy addition to the Wizarding World universe. For a movie that was overshadowed by its source, Crimes of Grindelwald stepped out of the shadow and sparked a light that will shine on itself. If Fantastic Beasts and Where to Find Them is The Philosopher’s Stone, then Crimes of Grindelwald is the Prisoner of Azkaban of the movies. The improvement in terms of narrative is that great! On a side note, Fantastic Beasts is most fantastic in IMAX. I saw LOTS of movies in IMAX but the 3D effect on the magic and creature really took me in the movies! Don’t forget to follow us on Instagram and Facebook for updates!